And that's a wrap. Another year, another Tokyo Game Show. As per usual there was plenty of commentary on social media about how the lack of new game announcements made the show a "poor" one, but being there on the floor, I've got a very different view about TGS: It's not about the announcements, and it was a particularly good event this year. After E3, which is positioned at the right time for game companies to be making their big announcements, and Gamescom in Germany, which has become a massive event in which developers refresh their product announcements, TGS is not the right time for companies to make big announcements. Sony has a pre-TGS stream now, which it uses to throw a couple of new Japanese titles at the market, but if you come to TGS expecting to be wowed by stuff you would never have expected, you probably will walk away disappointed. Because that's not what TGS is about. This show is an opportunity to get a feel for where the Japanese games market is at, and where it's headed. It's an opportunity for consumers in Japan to test out the games they're going to buy, which isn't very relevant to us, admittedly, and it's a chance for business leaders in Japan, journalists, and developers to get together to drum out ideas and have those one-on-one meetings behind closed doors. That stuff, in fact, is of intense relevance to us, even if we don't see the results right away. And it's an opportunity to buy awesome merchandise, which isn't relevant to people who weren't at the show but I now have a giant Blue Reflection tapestry and I felt like boasting about that. 1) eSports is something the Japanese are taking far more seriously now. It's really not my idea of a good time, so I didn't venture into the dedicated eSports section of the floor that had been set aside. Looking at it briefly it had all the nerdbro colours and attitude I expect from eSports, though. There were also plenty of lectures and panels on how to take advantage of eSports and what the Japanese market needs to do to address the opportunity, so it'll be a trend to watch over the next couple of years, I suspect. 2) VR and mobile remain far more important in Japan than they do in western markets. Mobile gaming is somewhat stagnating in the west, with players bedding down with the few existing games that they're willing to pay money into. But in Japan there's far more vibrant development going on, and Japanese players are happier to spend money on free-to-play microtransactions and the like. The mobile game booths, as in previous years, have been huge - and expensive - and every bit as important to the local market as the major publishers. VR, meanwhile, has an entire section dedicated to it at TGS, and that section is just filled with some of the most creative and oddball games you can imagine. Be it baseball, horror, or dating games, the quality of what's being produced seems to be taking that next step beyond the learning process that the industry has been going through in the first year of VR development. 3) There was a near complete absence of western publishers at TGS, aside from the indies. 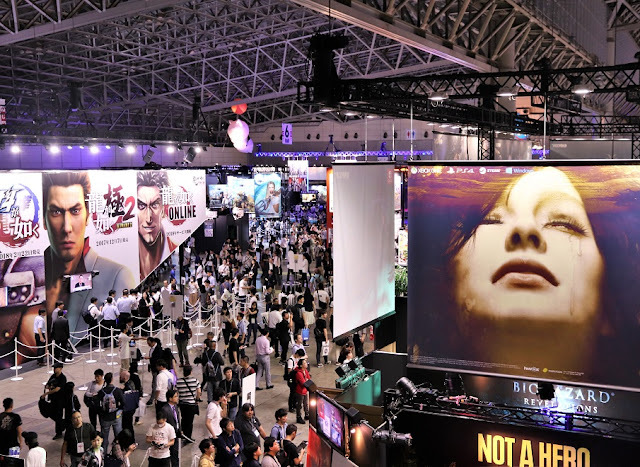 In years past, 2K, EA, Microsoft, and other large publishers had set up their own booths... and then had a fraction of the people at the booths that the Japanese publishers had. It would seem that these publishers have found it more cost effective to allow their Japanese publisher partners handle the PR work - SEGA, Square Enix and others that distribute western-produced games set up small sections of their booths for these titles now. 4) The games that would be popular in the west aren't necessarily popular here. Konami's LovePlus Every - a new mobile entry in the best dating game series of all (now with VR!) - had a longer line than Call of Duty. If that isn't proof that the Japanese have better taste than their western counterparts, nothing is. Actually, LovePlus outshone almost every game at TGS. The longest lines that I saw across the two days I was there was for it, Capcom's Monster Hunter, and a handful of Sony titles. No, I didn't line up for any of those. I'm as excited about seeing my LovePlus girlfriend in VR as the next person, but I wasn't going to line up for over 90 minutes for it. Fire Emblem Warriors - LYN! Fire Emblem Warriors is a real delight, and does very much feel like a Fire Emblem game, even as you're battling hordes of enemies in fast action combat. 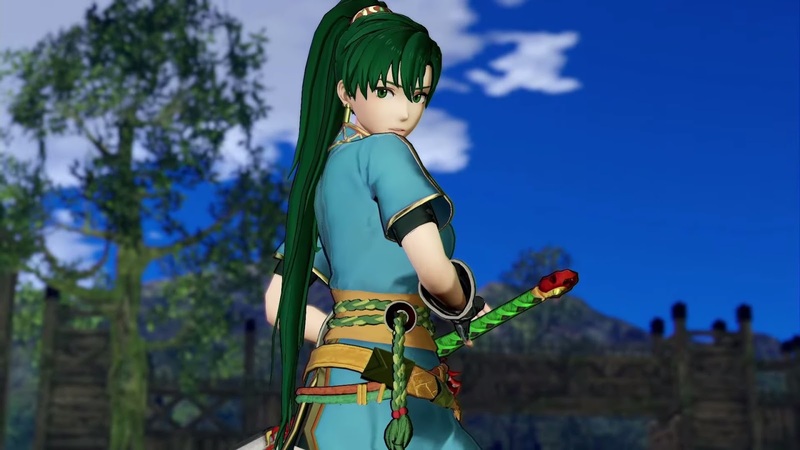 Each of the heroes feels substantially different - the pegasus knight controls nothing like the archer - and Lyn was the final boss of this particular demo, and she's as gorgeous and deadly as ever. I'm going to pick the game up while I'm here just to play the Japanese version on my flight home. It may just challenge Warriors All-Stars as my favourite Koei game in recent times. Dynasty Warriors 9 - Of course, Dynasty Warriors 9 might replace Fire Emblem Warriors and Warriors All-Stars too, because this demo was incredible. It really is an open world Dynasty Warriors game, combining the sheer scale of something like Bladestorm, with the brilliant, fluid, exciting action of the Warriors games. Being able to grapple up the wall of a castle before destroying the gate and letting your forces in was an incredibly cinematic experience. Atelier Lydie & Soeur - It's hard to get a real sense of a JRPG from a short, 10-minute demo at a game show, but here's what I can say about Gust's new Atelier title - the girls are utterly gorgeous, and the impressionistic art style of the world that you explore is distinctive and beautiful. Given the game's all about jumping into paintings to explore them, having such a painterly art style is both appropriate, and a good way of giving the game a unique look that we haven't seen in the Atelier games previously. Taiko No Tatsujin - The PlayStation 4 Taiko game is just brilliant fun. The drum peripheral that it comes with works perfectly, and all the colour and charm from the arcade game is represented here brilliantly. I believe you can play this with a standard controller, but why on earth you'd want to do this when you can have an arcade-perfect experience is beyond me. Bullet Girls Phantasia - D3's latest B-exploitation game wasn't actually in a state to demo the gameplay proper at TGS. There was footage of it, and it does look really good - as someone that found the PlayStation Vita one amusing, the shooter about blasting clothes off girls rather than caving their heads in with a headshot was always going to go down well on PlayStation 4 with its additional hardware power. The demo itself at TGS only allowed you to play the groping mini-game, where you can poke, slap, or pat a girl from whatever angle you want to. And I do mean every angle. The goal is to make her happy by patting, poking and slapping her in the right places. Those "right places" just happen to be places I wasn't game to in a public setting like TGS. The chances of this one getting localised are slim at best, but for all the uproar it would cause I genuinely expect that this will be a fun one to play. And hey, I didn't think that zombie schoolgirl shooter game would get localised, but Aksys proved me wrong, so who knows? I also played a handful of mobile games and chatted with various developers; plenty of interviews to come over the coming weeks. In short, I had a really, really good time at TGS this year, and of the four years I've attended, I'd have to say that this one was the most interesting and enjoyable.